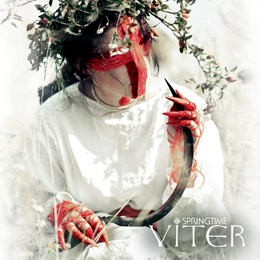 Viter is a Ukrainian band witch made the decision to not follow the usual path of vast majority of the bands. They play a mixture of folk, rock and metal, and search for their own unique sounding and look instead. Of course folk bands already exist for years, but they also tried other stuff on this record to be different. Witch explains their name, Viter was chosen as the name of the band (‘viter’ stands for ‘wind’ in the Ukrainian language), a perfect symbol for breaking all the boundaries and limits. To keep things interesting, these guys recorded and sampled traditional Ukrainian instruments (even a chicken witch was used in one of the tracks), brought their sounding closer to synthesized electronic sounds, introduced industrial noise, electronic instruments and powerful guitar riffs into their music. They themselves named this music style Folk’n’dustral. I have to admit that it is different from other folk metal bands without a doubt, but on their quest to be original i think they overdid it a bit to much. During certain songs they implemented to much stuff that at certain points it doesn't work to gather but rather the opposite. Most of the time it sounds out of tune and annoying.